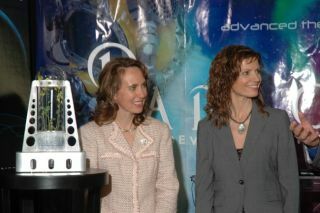 A prototype greenhouse sits next to U.S. Congress Rep. Gabrielle Giffords (left) and Jane Poynter, president and founder of Paragon Space Development Corporation (right). Paragon has teamed up with Odyssey Moon, a contender for the Google Lunar X Prize, to grow the first flower on the moon. This story was updated at 11:58 a.m. EST. The shooting of Representative Gabrielle Giffords and others in a violent rampage at a public event held yesterday (Jan. 8) in Tucson is likely to have effects that ripple all the way into space. Giffords (D-Arizona) was shot in the head at a local supermarket, where she was holding a constituent meeting, shortly after 10 a.m. MST (12 p.m. EST). At least 12 other people were wounded when the gunman opened fire, the New York Times reported. Giffords, 40, underwent surgery yesterday but remains in critical condition, according to doctors at the University Medical Center of Tucson. Giffords was first elected to office in 2006. She holds seats on the House Science and Technology, House Armed Services and House Foreign Affairs committees, and has served as chairwoman of the House Space and Aeronautics Subcommittee. Astronaut Mark E. Kelly, commander of STS-124, poses for a preflight photo. She is also married to NASA astronaut Mark Kelly – a veteran of three space shuttle flights – who is scheduled to command the final flight of space shuttle Endeavour, which is slated to launch April 1. Giffords' brother-in-law, Scott Kelly, is also a NASA astronaut. He is Mark Kelly's identical twin brother and is currently living aboard the International Space Station as commander of the Expedition 26 mission. The ramifications of the shooting for Mark Kelly's upcoming flight are unclear. "It is just too early to speculate," NASA spokesperson Nicole Cloutier-Lemasters told SPACE.com. "Right now the focus is on Mark and Scott, and of course, the victims and their families. For the time being, everything is day by day." Issues with the space shuttle Discovery's external fuel tank delayed that flight from its targeted Feb. 3 launch, consequently pushing Endeavour's STS-134 mission into April. But, these delays may provide extra time for Mark Kelly to spend with his family prior to his upcoming mission. "Because his mission was delayed to April, in some sense, that does provide some time for him to be away from [NASA's Johnson Space Center in Houston] and be with his wife," said Robert Pearlman, editor of collectSPACE.com (an online publication and community for space history and artifact enthusiasts). "In the interim, NASA will have to look at what training requirements they have, and he'll need to decide whether he wants to go fly or if he wants to remain at his wife's side." NASA chief Charles Bolden issued a statement yesterday calling Giffords a personal friend, and "a strong advocate for the nation's space program and a member of the NASA family." From the International Space Station, Scott Kelly also released a statement yesterday via Facebook. Unfortunately, NASA is no stranger to helping astronauts cope with tragedy, and the space agency will likely provide support and services to Mark and his family, as well as to Scott as he carries out the remainder of his mission on the station. "Scott has use of the IP phone to stay in close contact with his brother Mark and family and friends," Cloutier-Lemasters said. "He also used the onboard internet access to monitor news reports. Astronaut office management has also been in touch with Scott and will continue, with the flight control team, to stay in touch with him and assist with any other needs. At this time, the crew is continuing light work activities over the weekend." In 2007, astronaut Dan Tani's mother died in a car accident while he was living onboard the space station. Members of NASA's Flight Surgeon Office at JSC, flight controllers and crewmates all provided emotional support during Tani's grieving process. And while questions remain about the state of Endeavour's STS-134 mission, and whether Mark will stay in command of the shuttle's final flight, those issues are likely not the main concern for those closest to the situation. "I'm sure the entire NASA family is more focused on sending their thoughts for Representative Giffords' full recovery than they may be – at least for right now – on what the ramifications are for the STS-134 mission," Pearlman said.